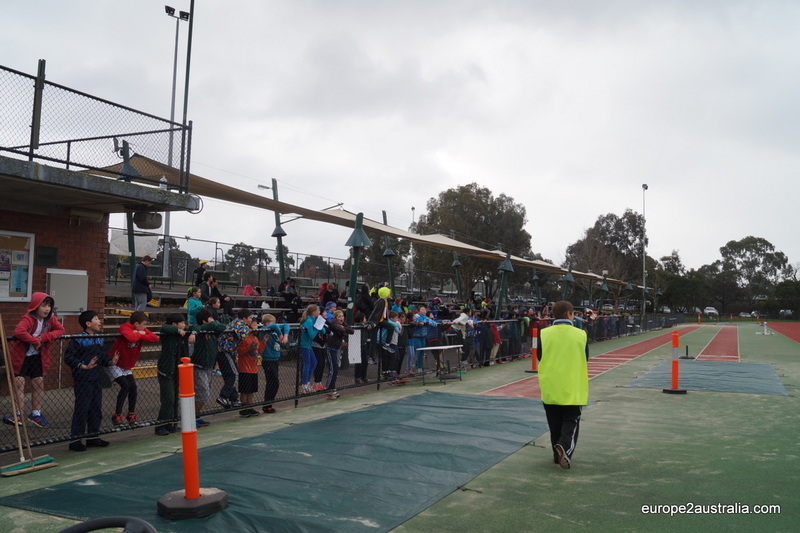 Today was school carneval athletics day for grades 3-6 of the Essex Heights Primary School, the last four classes of primary school. I volunteered, so a good chance for me to observe and experience everything from up close. And I made some discoveries. All the activities are real athletic elements. 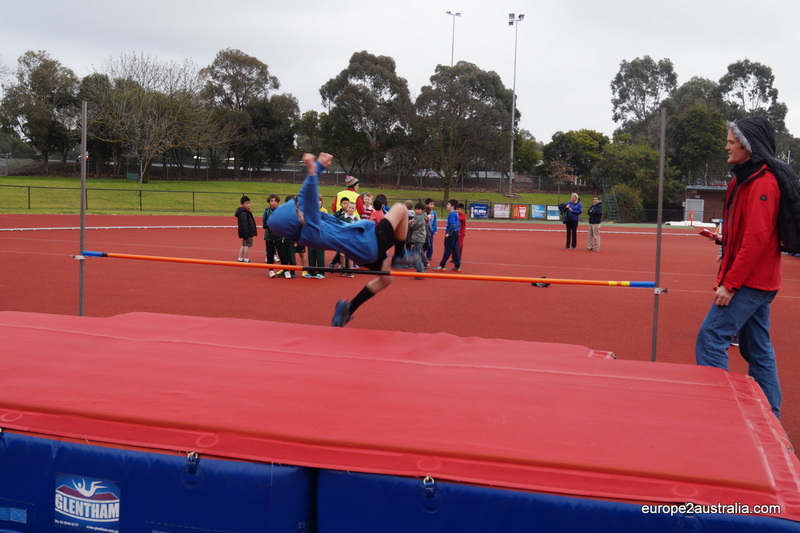 Here is the high jump, with very impressive techniques by some of the students. Kai, being new to it, did not perform bad either. He made it over 1 meter (which I find impressive with his 1,30m height). Everything is a real and fair competition. The youngest, grade 3’s compete against each other. Boys and girls are in separate groups. After that there are age groups, which also makes it a lot fairer than the class you happen to be in. There where real athletics elements like high jump, far jump, discus, 800 meters and sprint. After everyone has had a shot the results of the best four are called out, which included a lot of cheering from the others, and they would bring the results to the office where they received a ribbon. The results of this day will also be used to select the children who will be competing against other schools. 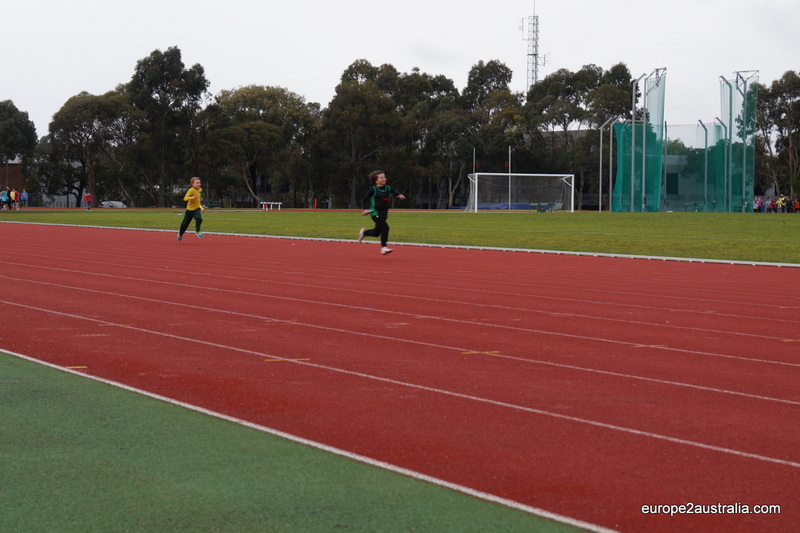 I have no idea yet how this will be done, but hopefully I will be able to blog more about that, as Kai is very enthusiastic, competitive and did pretty well in the 800 meters, far jump and high jump. Next to the individual achievements there is an added factor. Every group is also split up in four subgroups, which are called ‘houses’. Kai is in ‘house Linsey’. All the results of the children in that house are added up and in between the scores of each house are called out, which adds an extra competitive dimension. And a great way to also let the ones who have not ‘scored’ with an individual recognition be part of a winning team and to share in the victory! Throughout the school career you will remain in the same house, so you really are belonging to that group. Each house has its own colour. House Linsey is yellow, so I am afraid that we will have to go yellow shopping, since I expect more house challenges in different fields. Real school spirit: the whole crowd is cheering for their own ‘house’. The day was closed off with a relay. 400 meters by four people and the houses competing against each other. The last chance to add points for your house. The fastest runners get selected to run and the whole school is cheering like crazy for their houses. So every one is involved. A day full of competitiveness and school spirit. Very refreshing to see and experience as those are two elements that we are not used to in Dutch schools where the norm is to be the same and equal rather than to excel. And the houses are a great way to also let the less sportive children be part of a winning team and to share in the victory. You get to be a winner even if you are not actively participating! Kai was one of the runners who could run for his yellow ‘house Linsey’ to add the last points for the victory, in the relay run for boys third grade. Sportskanone! Super. Die Sache ist ja schon gut gemacht. Trotz “Bestenauslese” gibt es keine wirklichen Looser. Tolle Idee das mit den Häusern. Hat denn die “Sportlermutter” auch andere Sportlermütter getroffen und sich mit ihnen ausgetauscht? Schönes Wochenende – und hoffentlich nicht so kalt! Dit is helemaal super voor Kai. Hierbij is hij 300% in zijn element. Hoe gaat het met Kai en Luka nu verder op school? Gaat het al wat beter met de taal?